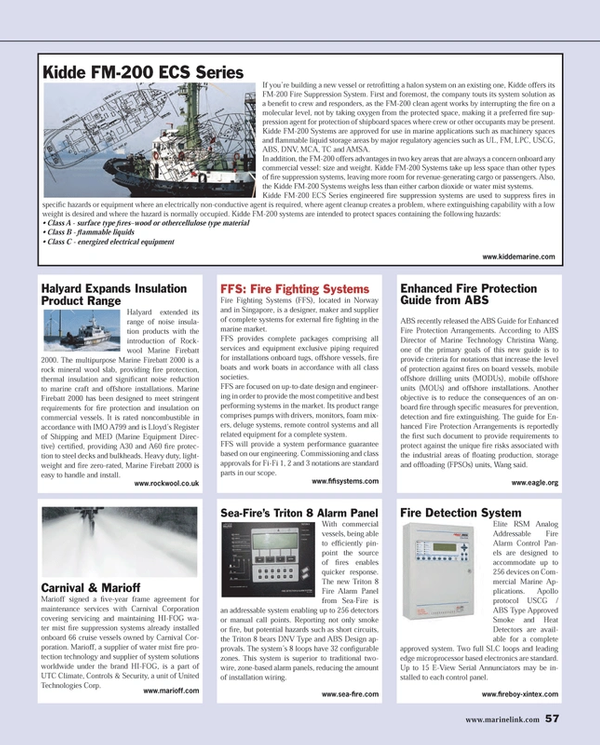 If you’re building a new vessel or retrofitting a halon system on an existing one, Kidde offers its FM-200 Fire Suppression System. First and foremost, the company touts its system solution as a benefit to crew and responders, as the FM-200 clean agent works by interrupting the fire on a molecular level, not by taking oxygen from the protected space, making it a preferred fire suppression agent for protection of shipboard spaces where crew or other occupants may be present. Kidde FM-200 Systems are approved for use in marine applications such as machinery spaces and flammable liquid storage areas by major regulatory agencies such as UL, FM, LPC, USCG, ABS, DNV, MCA, TC and AMSA. In addition, the FM-200 offers advantages in two key areas that are always a concern onboard any commercial vessel: size and weight. Kidde FM-200 Systems take up less space than other types of fire suppression systems, leaving more room for revenue-generating cargo or passengers. Also, the Kidde FM-200 Systems weighs less than either carbon dioxide or water mist systems.